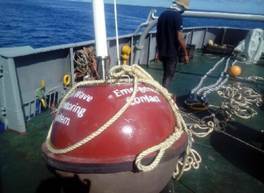 As a part of the 'Integrated Ocean Information System' for the Indian Ocean Countries, the Indian National Centre for Ocean Information Services (INCOIS), Hyderabad of the Ministry of Earth Sciences, successfully deployed a Wave Rider Buoy off the Frigate Island, Seychelles. Ocean state forecasts are imperative for safe navigation and operations at sea. The 'Integrated Ocean Information System' is being established by INCOIS under the technical cooperation umbrella of the Regional Integrated Multi-Hazard Early Warning System for Africa and Asia (RIMES). India is serving as the Chair of the RIMES Executive Council represented by the Secretary, Ministry of Earth Sciences. This event is a follow up to the inauguration of the Earth System Sciences Organisation (ESSO) -INCOIS Ocean State Forecasting System for Seychelles and Sri Lanka by Dr. Harsh Vardhan, Union Minister for Science and Technology, in July 2015 at the 2nd RIMES Ministerial Conference in Delhi. The ocean data collected will be useful not only to validate the Wave and Sea Surface Temperature (SST) forecasts from INCOIS for the oceanic region surrounding Seychelles in real time but will also help in analysing and tracking high swell events originating from the Southern Ocean and arriving at the southwest coast of India. These observations will help in further strengthening and enhancing our capability to predict the occasional High Wave events (Kallakadal) that often attack the Kerala coast causing damages to coastal villages and fishing boats. To ensure the buoy safety and easy retrieval, a 'Buoy drift alert system' has also been developed and implemented. All concerned officials will receive the alert, in case the buoy drifts more than 200 metres from its position. The Country experienced significantly above normal temperatures during the last two months of January and February,2016, with monthly anomalies of 1.530C & 20C respectively from 1961-90 normal. The year 2015 was the third warmest year ever recorded since 1901. During the Hot Weather Season of 2016 i.e. April to June warmer than normal temperatures are expected in all meteorological sub-divisions of the country. Seasonal (April-June) average temperatures over northwest India are expected to be above normal by more than 10C. Above normal heat wave (HW) conditions are very likely over central and northwest India during the Hot Weather Season of 2016. The figures below (Fig.1, Fig.2 & Fig.3) show the forecast for the subdivision-wise averaged maximum, minimum and mean temperature anomalies (departures from the long term normal) respectively over India for the hot weather season (April to June, 2016). The forecast indicates that during the hot weather season of 2016, temperatures (mean, maximum and minimum) in all the sub-divisions are likely to be above normal. All the temperatures (maximum, minimum and mean) of most of the sub-divisions from northwest India, Kerala from south India and Vidharbha from Central India are likely to be above normal by ≥10C. Many parts of the country experience heat wave conditions during the hot weather season leading to many adverse consequences. Abnormally above normal temperatures can have devastating effects on human health, water resources and power generation and outage. There is a marked relationship between human mortality and thermal stress. During the summer of 2015, prolonged severe heat wave conditions prevailed over Andhra Pradesh and parts of Telegana which claimed more than 2500 lives. The recent research analysis suggests that frequency and duration of heat waves over the country are showing an increasing trend. A part of the increasing trend is attributed to increasing greenhouse gases due to anthropogenic activity. In addition, the ocean conditions over the equatorial Indian and Pacific oceans also contribute to the variability of heat waves over the country. In the past, El Nino events over the Pacific are known to cause severe heat wave conditions over the country. The strong El Nino conditions over the Pacific Ocean that started in 2015 are still continuing. However, the latest forecasts indicate that El Nino conditions are likely to weaken further and reach weaker El Nino conditions during the hot weather season of 2016. It has been observed that during the hot weather seasons followed by El Nino years (for example: 1973, 1995, 1998, 2003, 2010, etc. followed by the El Nino years of 1972, 1994, 1997, 2002 and 2009), above normal temperatures including moderate to severe heat wave conditions were experienced in most parts of India. In view of its social relevance, India Meteorological Department, Ministry of Earth Sciences has initiated a seasonal outlook for summer temperatures over the country based on predictions using an ocean atmosphere coupled climate model. From this season, IMD will also provide extended range forecasts (5 –day averaged forecasts for next 15 days) of heat wave conditions over the country. This will be based on the Dynamical Extended Range Forecasting System developed by IITM Pune. The forecast will consist of probability of occurrence of hot days, heat waves and severe heat waves for the next 15 days updated every 5th day from 1st April, 2016 onwards. The forecasts will be made available through IMD, Delhi website (www.imd.gov.in). Under the Monsoon Mission, the Indian Institute of Tropical Meteorology (IITM), Pune of the Ministry of Earth Sciences has been developing a state-of-the-art coupled climate model for generating monsoon forecasts known as the Coupled Dynamical Forecast System. The model has a spatial resolution of about 38 km and improved modules of model physics. The model was used to prepare the monsoon forecasts for the 2015 monsoon season. The analysis has shown that the same climate model has useful skill for predicting seasonal temperatures during the Hot Weather Season (April to June) over India. Therefore, this climate model was used to prepare an outlook for the summer temperatures of 2016. The model climatology was prepared using retrospective forecasts generated for 27 years (1982-2008) based on the February initial conditions. The model showed moderate skill for summer temperatures over many subdivisions over northwest and central India. The forecast for the hot weather season of 2016 was prepared using 47 ensemble member forecasts.